Kiwifruit: The Genus ACTINIDIA includes extensive and full coverage of scientific and applied information, ranging from basic taxonomy, population genetics, and natural resources/distribution, to domestication history and breeding/cultivars, also including further information on culture and international production and commercialization. 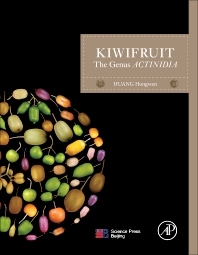 The book gathers information not previously available in the English language, providing an authoritative reference for professionals, including taxonomists, horticulturist, breeders, conservationists, kiwifruit technicians, college teachers, policymakers in the industry, and governments. In addition to those in the academic and professional sectors, horticultural and botanical enthusiasts will find the information presented highly accessible. Botanists, horticulturists, taxonomists, plant breeders, conservationists and kiwifruit technicians & extension specialists, college teachers & students in botany and horticulture related majors. This book also can be used as a reference for Kiwifruit growers, gardeners, and horticultural and botanical enthusiasts. Professor Huang started his research career as plant germplasm collector and fruit tree breeder of kiwifruit (Actinidia) and chestnut (Castanea) and his career spans over 30 years in arena of plant genetic resources and breeding, with experiences as co-principal investigator and co-investigator positions for a number of research projects funded by USDA, European Union, China Ministry of Science and Technology and Chinese Academy of Sciences. He is best known for kiwifruit (Actinidia) research and breeding and responsible for founding Actinidia section of Chinese Horticultural Society and has served as Chairman since 2002. He developed and released novel yellow-fleshed kiwifruit cultivars (Actinidia chinensis) grown worldwide for commercial production. His long time research focused in Actinidia are well received by the world kiwifruit research community as well as world kiwifruit industry and highly valued him a lifetime achievement award by ISHS Kiwifruit Working Group in 2010. He is author of >200 publications and holder of 15 registered or patented cultivars. He is currently Secretary General of International Association of Botanic Gardens (IABG), Vice chairman of Chinese Botanical Society and coordinator of East Asia Botanical Gardens Network. Professor Huang also serves as chair of ISHS Kiwifruit Working Group two terms (1999-2002; 2010-present).